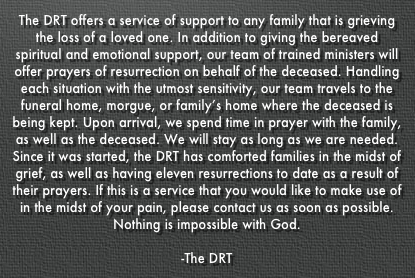 According to this website, if you’ve recently lost a loved one, Tyler Johnson and his team can and will visit the funeral home, morgue, or family’s home and raise the recently deceased from the dead. So far, they’ve allegedly raised eleven people. Tyler wanted to see others spared of the pain his own heart went through that morning that he held his own father in his arms as he died. Tyler’s hatred for death is not just theological, but closely linked to his own experience. This led Tyler to fling himself into praying for the dead whenever he got the chance. Soon others heard about this, especially after resurrections began to take place, and began to join him. After some time, the Lord released Tyler to travel and train others in the revelation of Christ: The One that is Abundant Life. Dead raising is for every believer, not a select few. In fact, in order for the dead to be raised on a consistent basis, there needs to be people that are ready to pray for resurrection in different geolographical locations across the globe…. Well. I’m rather speechless. I thought death was a normal, yet very sad, part of life. Now it’s some sort of enemy that the average person, excuse me, I should have said “believer,” or perhaps, “true believer” can avoid. 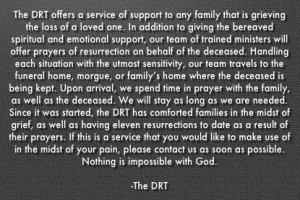 You can get specialized training in raising the dead. You can like them on Facebook. Tyler Johnson has a page, too. I’d be inclined to think of this as a poe, except the BBC has covered this phenomena as well. Sadly, Johnson will not provide any documentation to support his claim that he’s raised ten corpses back to life. As of today, you can pick up a copy for a “Premiere License for Public Screening” for only $250. I don’t know how much the actual DVD/Blueray will run. Now… so many questions… so many questions. 1. How does this work? How much does it cost? What about the people who have this done, but it doesn’t work (I’d assume there would be a LOT of people in this category). I caught the whole “What if they don’t want to come back” disclaimer in the above vid, but seriously… they’re selling a big promise. I can’t possibly see how they’d deliver. 2. Do you think it’s just a tiny bit cruel to visit the hospital room of the dying and make them think they’ll rise from the dead? 3. How would a typical family react to this? Would/could they sue for product non-delivery? Would any attorney actually take on a case like this? What kind of insurance do they have? How would you build a policy like that? 4. How on earth did they raise so much money for that film? Do people actually believe you can raise someone from the dead? 5. How did they get so many Facebook likes? Again… don’t people utilize their BS alarm? Granted, some of the Facebook comments are rather amusing. 6. Once someone is “raised” (assuming it can be done), are we talking about a zombie situation? What about brain death? What happens to the tumors, damaged heart… the reason they died in the first place? It’s one thing to fleece people who don’t know better. It’s quite another to take advantage of families when they’re at their most vulnerable. I can’t believe anything like this exists. Please. Someone tell me this is an elaborate hoax. I join you in hoping that this is entire thing is a joke of some sort. My brother has sadly passed away on the 30th March in UK.He was only 36 yrs old and today is the 15th day.God has given us hope and believe in faith that he will rise up. From the 2nd day we all family,my church and most of the churches are praying for his resurrection. I am a pastor myself. My sister and family is in UK at the minute. She is a strong believer in God as well and so was brother born again. My brother is still in the mortuary. My cousin Dhiraj Shinde (Bombay) suggested your name. So I request you to join us in faith and pray for the same. 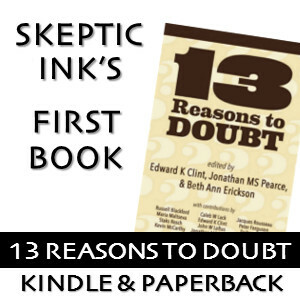 Barring the skeptics, those who doubt or question (especially the Christians who believe Bible as the Word of God) the possibility of dead being actually raised, should also doubt and disbelieve all such miracles performed by Jesus and chronicled in the Gospels about resurrecting the dead! Obviously , what comes to my mind is the story of Lazarus being brought back to life after being dead for four days!. However, the Word of God is suspiciously silent as to whether the woken up Lazarus lived as a Zombie or a normal person. As for the question whether the dead would like to come back or not anybody’s guess would be as good as mine. Or is there a way to know about a dead person’s actual wish?